We are often asked about the unsettling gunk one encounters in the bottom of a five liter tin of olio nuovo. Unsettling, is a most appropriate word, if for a very different meaning - in this case, it is because it is, in fact, unsettled. 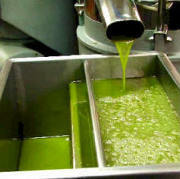 Olio nuovo is very special and is made different from other oils. Acually, this is not entirely true. All extra virgin olive oils are made the same: olives are washed, crushed and pressed. Then the oil is separated from the solids and the water. Basta. That's all. Extra virgin olive oil is the only oil that we eat raw. It is the only one that is made by simply crushing and pressing the fruit, grain or vegetable. There is no refining, heating, extracting, use of chemicals or other process; just cold (no heat applied) pressing of the olives. Every other oil (canola, corn, safflower, peanut, and even regular olive oil) goes through a refining process using high heat and chemicals to extract the oil. Extra virgin olive oil is very unique because you are essentially eating a component of the raw fruit, and this is the secret of its spectacular health benefits and wonderful taste. This process leaves quite a bit of particular matter in the oil – solids, or sediment, that is not completely extracted. After crushing, the oil goes into settling tanks for several months before it is drawn from the top, leaving the sediment in the bottom. Most olive oils in Italy start to be bottled in about March or even later. If it is still very cold, the oil might not be fluid enough for the bottling equipment, delaying even further. Before bottling, depending on the whim of the producer, the oil is further filtered (usually with pure cotton), or the top-drawn oil is bottled directly. When filtered, it produces a golden, clear liquid of uniform color and clarity. If not filtered, it should be labeled “unfiltered,” producing a slightly cloudy and more pungent oil that has a shorter shelf life. Guido Vestri, the maker of Olivestri oil, prefers to filter his oil, but both filtered and unfiltered oils are enjoyable. For olio nuovo, this just-pressed oil is bottled directly, as is here with no further processing. Olio nuovo is different. It is the exact same oil destined for the settling tank, but it is bottled (or tined) directly as it comes from the spigot when crushed – in its raw glory, complete with all the solids. It is this intense fresh fruit taste that makes it so special. In central Italy it is prized and ends up on restaurant tables to accompany almost every imaginable dish. During the crush, people come from the cities to the mills to attend the new harvest festa and to buy bottles of nuovo for their home or gift giving. This olio nuovo has a very special character when it is very young, and the whole point of it is to use it when it is young. The color is intensely green and the aroma and taste are like fresh olives. It is actually quite amazing to see how quickly the color turns from deep green to golden once exposed to air. If not consumed completely while still young, the nuovo will change over time and becomes regular olive oil. This is why we fly in the nuovo as soon as it is crushed so people have the rare chance to enjoy the special bloom of the nuovo. In a lager tin, like the five liter that we sell, the solids will settle to the bottom, just like they do in the large settling tanks. If the tin is kept away from heat, the oil should not deteriorate and can be enjoyed over several months. This is one of the enjoyments of buying nuovo in tins, so you can experience the oil as it changes and becomes mellower. The solids, however, become quite bitter as they age, so are not a pleasant addition to your food preparations, and we recommend discarding the messy-looking gunk. On the other hand, when the nuovo is young, a good strategy is to agitate the tin by turning over a few times to suspend the solids which will give the young oil a more intense and fruity flavor (it is after all fresh olive pieces). What About Nuovo in Bottles? Yes, of course, this same sediment is in the bottled oil. It is after all the same oil. The smaller quantity of oil, however, makes the sediment far less noticeable. If you leave a bottle of nuovo undisturbed for some time, you will see that there will develop quite a bit of sediment in the bottom. These are perfect green olives ready for crushing at Frantoio Olivestri. Recommendation: Buy your olio nuovo to enjoy when it is new. If you get a five liter tin and expect it to last a full year, (first off, you are using too much butter! ), you might want to buy a few bottles of nuovo and then buy a tin in March when we will have the same oil - but it will be drawn from the settling tank and filtered. This is the oil we sell all year to our restaurants. It has impeccable structure and will last a very long time. It is, however, important that you care for you oil, and we have some recommendations here: Caring for Olive Oil.